Named after the old-timers who gather for coffee and talk in the early morning, the Old Timer Café has been a staple of in the Mission Valley community for 27 years. Many of the original old-timers have died and new old-timers have been inducted into the 6 a.m. coffee ritual, an affair that combines good-natured bantering and camaraderie. Many of the morning customers are in their mid-70s and hearing-impaired, so much of the jesting goes unheard. But the chatter is always lively. Two regulars, Jim Hackney and Leonard Pierce, own local competing construction companies. They joke that they sit across from each morning because it’s easier to slap each other that way. Charlie James, another old-timer, developed the popular Sweetheart Magazine, a publication that connected singles with each other before the Internet. Even though the magazine hasn’t been published for a while, James says he still gets messages from singles looking for love. Although The Old Timer Café has had four sets of owners since 1984, cook Tracy Orr has been with the café since the beginning. 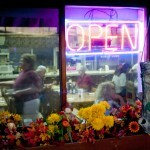 She said the café has its fair share of regulars, from local Amish families and Griz fans to famous Nashville singers. But the food is just part of the attraction, she adds with a laugh. “Actually, you get entertainment when you come here,” she says. 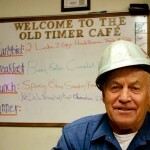 The Old Timer Cafe wakes up with the sunrise. 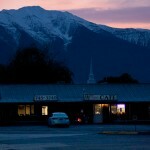 The Mission Mountains provide a spectacular backdrop to this western-themed cafe. A wooden log greets customers as they enter The Old Timer Cafe. The newest band of old timers laugh with co-owner Julie Burckhard during their daily 6 a.m. gathering. Leonard Pierce, a member of the 6 a.m. old timer gathering, helped build the cafe 27 years ago and is a regular old timer now. 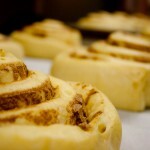 Cinnamon rolls rise in a special room during the evening at the Old Timer Cafe. A mirror catches the reflection of co-owner Julie Buckhard laughing with a customer. 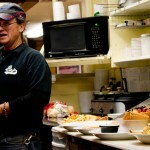 Jim Burckhard, current co-owner of The Old Timer Cafe, prepares meals at the St. Ignatius eatery. 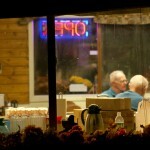 Burckhard and his wife, Julie, have owned the cafe for eight years. Alda Allen sits in “her” booth eating breakfast. 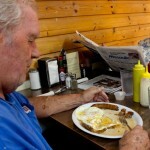 Allen has been coming to The Old Timer Cafe for 17 years and always sits at the same table. Her 95th birthday was on Nov. 28. Vernon Posio enjoys dinner with his cousin Ann Fyant. Posio plows the highways around St. Ignatius and Fyant used to be the rural mail carrier for the Mission area. 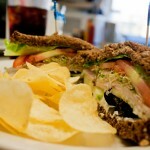 A turkey veggie sandwich waits to be served in The Old Timer Cafe. The cafe is well-known for its variety of sandwiches and burgers, as well as its all-day breakfast menu. Tracy Orr works the morning rush at the cafe. 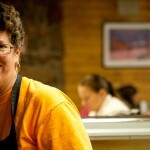 She has been a cook at The Old Timer Cafe since it opened in 1984. The 6 a.m. old timers gathering gets started early on a fall morning.